Since when is losing your temper over politics grounds for suspension of a columnist? I was writing feverishly this past weekend trying to get past the doom and gloom around the shuttle problems and get some of the lesser known alternatives out there to be discussed... I talked about how the mecury-redstone capsule escape system (and the later Apollo variant)was probably the best we'd ever come up with, why shuttle-C was a bad idea, questioning why we needed a 100 metric ton lifter... and I didn't finish the piece. This morning, none other than the NY Times quotes Michael Griffin: As long as we put the crew and the valuable cargo up above wherever the tanks are, we don't care what they shed," he said. "They can have dandruff all day long." - and the rocket concept looks good (left). A two stage design with a minimal number of motors. There's issues, of course - as the SRB has to support 250k lbs it wasn't supporting before - and I'd be slightly happier if we modified an existing stack from another rocket, rather than shuttle parts... but the engineering does look promising, and politically feasible. here. I was really quite surprised by the proposal for a single solid stage for the replacement. I guess I was just raised on liquid fuels. 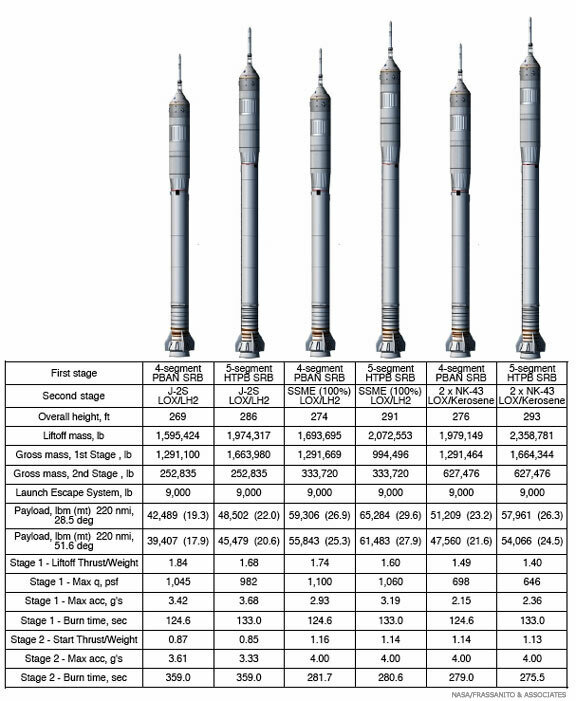 I thought that the SRBs weren't steerable, either... anyway, in a month or so, we'll know.